Neil Tennant and Chris Lowe are in the mood to dance. 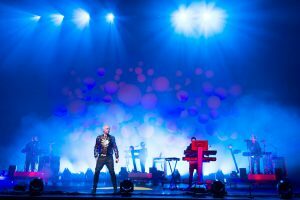 As Pet Shop Boys, the two have been pairing commentary on the ups and downs of love, nightlife, politics and history with lush pop compositions for nearly 30 years. The quantity and quality of their output is staggering — LPs, compilations, film scores, plays, a ballet, books, one-off singles and production work for other artists fill their vast catalog — and the UK duo’s 12th studio album Electric (out July 16 – pre-order here) stands among their best. (Believe me: “Axis” and “Vocal” are only the tip of the iceberg.) If you’ve been on the market for music to punctuate your upcoming summer nights, Neil and Chris have delivered in spades with this nine-track set. What is noteworthy is that the upbeat Electric will arrive less than a year after their previous LP, last fall’s pensive Elysium. It’s also the first Pet Shop Boys album to be released on their own label, x2 (pronounced “times two”), through Kobalt Label Services, after ending their longtime association with EMI/Parlophone . I had a lengthy talk with Neil and Chris about Electric in May, in which they explained, at times hilariously so, the making of the album and the inspirations for many of their rhythm-driven new songs. Dive into the interview below. It’s an absolute pleasure to speak with you both. Given that you have your own label now, are you finding there are work-related duties you never had to do before? CHRIS LOWE: It’s very early days for us, yet, with this new arrangement and going through the label services. It hasn’t affected us personally, but it might be more work for our management company. We don’t know yet. We’re only at the beginning of the process. NEIL TENNANT: We’ve always had a very hands-on approach to what we do anyway. So at the moment, it doesn’t feel much different, really. And also Kobalt are a big, global organization. In a sense, it’s being with a big, global record company — they have offices all over the place. I kind of wondered when we left Parlophone whether [we’d] sort of feel a bit out in the cold, but it doesn’t feel like that at all. Is it within the realm of possibility that x2 will offer up releases by other artists, in addition to Pet Shop Boys? NEIL: When we left Parlophone and signed to Kobalt, it hadn’t really been at the forefront of our mind that would involve us having our label. But when you have a label with a logo — it’s got a very elegant logo — you suddenly think of other things you could put on the label. At the moment, we have no plans [to release material by other artists] at all. But I think it’s obviously possible that we could do that. Indeed you did! And I remember buying a particular issue after school one day, because you two were featured. Inside, there was a small writeup on a duo called Times Two. NEIL: Really? Were they American? NEIL: I’ve blocked that. I’m sorry, I don’t remember them at all. NEIL: Yeah, it does. Totally. It’s quite a fast turnaround, given that Electric will be your second album in a 10-month span. How many of these tracks were written during the sessions for Elysium and held over? NEIL: I think about half. “Axis” was. “Axis” was written right at the beginning of Elysium. “Vocal” was almost the first thing we wrote for Elysium. And then “Shouting In The Evening,” there was kind of a rough demo of it. The new songs were “Love Is A Bourgeois Construct,” “Bolshy” — “Fluorescent” was only written in the last six weeks. It actually had the quickest turnaround from being written to being on a record that we’ve ever had. It’s one of the reasons why the record was delayed. That’s right — according to the original announcement, Electric was supposed to be out by now! NEIL: Originally it was going to be [released] in June. Well, there are other reasons as well, but six weeks ago [‘Fluorescent’] didn’t exist apart from the rough instrumental demo that Chris had made. We’ve always had the idea that when you make a record — I’m talking about Elysium now — you make song choices. And we had this idea of making it a very reflective and, as you put it, autumnal album, which is a good word for it. We [then] thought we were going to do what we called the Dance album. But that, the Dance album with new songs, has turned into something bigger, which is the Pet Shop Boys’ 12th album. It’s kind of a remarkably quick turnaround after Elysium. But we feel really excited about that. When we go out on tour, we’ve got two new albums to play songs from. We’ve been through a very prolific writing phase. We’ve written Elysium, Electric and also the Alan Turing work, which we’ve pretty much finished now, and that’s all within the last two years. So let’s begin with “Axis,” which sounds a bit Giorgio Moroder. I recall you were going for that sound back with “So Hard” off Behaviour. Was there ever a point in your career where you considered working with him? CHRIS: Hasn’t Giorgio Moroder just worked with Daft Punk? NEIL: He has. It’s funny, because when it was announced that Giorgio Moroder had worked with Daft Punk, there was a kind of brief conversation about what Johnny had said. And also, on our last album, Elysium, we actually considered approaching Nile Rodgers to produce it, because we met him at a festival in Japan. But then we heard that he’d been ill, so we didn’t. We ruled it out. Anyway, it’s great to hear that he’s back, and I think it’s great that Daft Punk have got both those guys on that record. Stuart Price produced Electric. From a distance, that collaboration seemed to be on the horizon for awhile now. CHRIS: We worked with Stuart on the programming of the last show and also on this show, so we already knew that we got on well. We like the same things, so it’s a very natural thing for us to work with Stuart. It was effortless, really. When we were writing some of these dance songs, we clearly imagined Stuart producing them. Neil, you mentioned the track “Love Is A Bourgeois Construct,” which contains what I feel is one of your most “up,” giddy intros. NEIL: It’s a sample of Purcell. It’s not a sample at all, actually. It’s being re-played by Stuart from the original sheet music. Where did the idea for this song come from? NEIL: In terms of the lyrics, I read this novel from the late ‘80s by David Lodge called Nice Work, which is one of three novels he wrote set on a university campus in the Midlands in Britain — based on Birmingham, actually. And in that novel, a university lecturer in English has to shadow a guy who runs an old-fashioned industrial factory in Birmingham. In the course of this, the guy who runs the company falls in love with the lecturer, who he can’t stand in the beginning. There’s a great moment where she says to him, “Love is just a construct of Victorian fiction. It’s a middle class idea.” It just gave me the idea of the phrase “love is a bourgeois construct.” And that, for some reason, just suggested this story about a guy whose wife — or whatever, girlfriend — left him, and he’s led a very respectable bourgeois life. He’s seen where it’s got him, his wife leaving him, so he’s going to give up the bourgeois life and lie around and be lazy and read and not try hard anymore. But it all came from a paragraph in this David Lodge book. A few songs, like “Inside A Dream” and “Thursday,” capture the excitement that comes with hearing brand new Pet Shop Boys music, but they also sound like instantly recognizable compositions from the two of you. Did you set out to reference sounds you’ve worked with before? NEIL: I don’t think we deliberately set out to do that. Some of that is probably Stuart’s influence. It was something we got into that we liked. Across the album — although I don’t know that it occurred to us until it was finished — there are a lot of bells. At the start of “Bolshy”; there’s a great bell line in “Inside A Dream” — it’s absolutely fantastic. In the mid-‘80s, we always loved the bell sound Madonna, particularly, used to get on her records in those days. I think also there’s a simpler approach. You can hear what each sound is doing. The bass sounds to me early-‘80s-ish. But we never at any point sat down and said, oh, let’s make a record that sounds early-‘80s. CHRIS: Actually, if you play it back-to-back with a record of ours from the ‘80s, it would sound completely different. But they’re sort of from the same place. A lot of the studio production techniques are very, very contemporary. You couldn’t even do a lot of the stuff that’s on this record back in the ‘80s. It really could only be made now. The track “A Face Like That” off last year’s Elysium almost plays like a preview of Electric, given that it’s more up-tempo. Did you ever consider holding it for this album? It seemed that fans latched onto that song in particular, as well. Were you surprised at the reaction to “A Face Like That”? NEIL: I don’t know that I was really aware of it. CHRIS: I’m not aware of any reactions! [All three laugh] Actually one thing I don’t like now is that you can be aware of what people think of everything you do. You can’t do anything these days without comments everywhere from people. So I try not to look at all the comments on iTunes and stuff like that — because when you do, I wish that I could reply back, and we don’t have that facility to tell them what I think of their review! I’d make some horrible personal comments about them, as well. I remember, Chris, there was a time when you were on Twitter — maybe about four years ago? “Thursday” sticks out as a real pop gem on this album. How did this particular day of the week earn the honor of being immortalized in song by Pet Shop Boys? CHRIS: Basically — I don’t know if it’s the same in Los Angeles — but in London, Thursday is really the start of the weekend now. Everyone goes out on a Thursday. No one can be bothered to wait until Friday anymore! So that was just the title. When you’re writing a song in Logic, in order to save it, you have to come up with a title. So I come up with loads of crap titles, which very rarely get used. NEIL: Well, there are two of them on this album! CHRIS: Yeah. But I normally come up with them simply to save the song. I never expect them to end up being used in any remote way. NEIL: Something that happened with this album is that Stuart Price wanted us to work on the tracks in alphabetical order, which is how the album did indeed work out. And so we got up to “Thursday Night Special” in alphabetical order, and that was just reduced to “Thursday” then, when it was saved, while we worked on the music for the track. It really fits it, musically, in that place on the album. I remember being at home and thinking, well, I’ll have to think of a lyric for a song that you can call “Thursday.” I was in my kitchen and I just thought of this very simplistic thing: Thursday, then Friday — it’s soon gonna be the weekend. And it took off from there. What brought about the Example collaboration for “Thursday”? NEIL: We had this idea of having a rap on it, and we downloaded from the Internet an a cappella of Nicki Minaj. And that was in the rough mix. Actually, it sounded really good on it, too. CHRIS: I think you could probably put her rap on any record and it would sound good. NEIL: Yeah. What song was it? CHRIS: I can’t remember now. Not a very famous song. NEIL: Anyway, we discussed having a rapper — endless discussions about who to ask to do it. Then Stuart was going to be working with Example, who is, of course, a rapper and a singer, and we persuaded Stuart to ask Example if he’d do something. And Example was really into it, which was great! He said he’d do it if he could sing, as well. He took the track away and spent quite a while working on it. We weren’t there, by the way — this was all done in Los Angeles and we were in England, I think. He did this great rap and he sang a different melody and words over the chorus. So then we had that, and listening to the chorus that I’d sung — “Thursday, and Friday, it’s gonna be the weekend” — sounded like we could have something with a bit more energy. So we came up with another chorus, which was kind of influenced by what Example had sung: “It’s Thursday night, let’s get it right.” And then we put them all together. It was quite a lengthy process, but I think it works really well. It’s certainly one of those songs that keeps unfolding. It’s quite beautiful, actually. NEIL: Thank you. And his rap style is gorgeous. It reminds me of, as Stuart suggested, [something] like Sugarhill Gang, or that sort of period. It’s not like ego rap. It’s like that warm, rhythmic rap. The roll-out for this album feels very similar to Elysium last year, when “Invisible” was unveiled as a buzz track before the single “Winner.” Was that the same thinking with “Axis” and Electric? NEIL: You’re right, but the question is nowadays, what is a single? You can buy this single track on iTunes — it’s actually being released on 12” vinyl, as well — so in that respect it’s a single. We don’t expect to get overwhelming radio play with it. I don’t think it’s been formally serviced to all radio stations. It has been serviced to one or two. I think what we really wanted to do with this is establish that this is a very dance-based record. We really want to make sure that’s the vibe that goes out with this record. But it’s interesting what a single means now for us. We’re not going to get that radio play in Britain. It’s not possible because of our age. It doesn’t matter what record we made. We’re very grateful Radio 2 plays our records, and that one or two other stations do, but broadly speaking, they’re just not going to play it. So you have to look at that as a kind of freedom thing. You can put out something whenever you want, really. You don’t have to follow those airplay rules. In that respect, it must feel like a very exciting time for Pet Shop Boys. NEIL: It does — it feels like it for us. I inevitably have to ask about the Bruce Spri gsteen cover on Electric, “The Last To Die.” I wasn’t familiar with that particular song before. How did it come to your attention? NEIL: How did she get to hear it? CHRIS: I’ll ask her, because I don’t know. It’s quite obscure and, actually, I don’t think my sister is a big Bruce Springsteen fan. I will ask her how she came across it. But, anyway, she recommended it to us, and the thing is, when you listen to it, you can really imagine how we could do that song. It’s got a fantastic guitar riff that would immediately translate into a synthesizer riff — even though it ended up as a vocal riff on our version. But it works for four on the floor. The lyrics are very uplifting, really. I think it’s fantastic. And also, we sort of imagined that it would be a bit like a Killers record, working with Stuart —a mixture of rock and electronic dance music, with a bit of filter thrown in for good measure. [“The Last To Die”] sounds like a Pet Shop Boys record. Speaking of The Killers, given that Brandon Flowers is a fan of Bruce, I was going to ask if he’d heard your take on this song, and what he thought of it? CHRIS: Brandon would probably have heard it, I think. NEIL: Stuart said he liked it. NEIL: [Also laughing] We discussed it but then we thought, it’s a bit too Killers then, isn’t it? It’d seem a bit cheeky if we approached him. I think that actually could have worked pretty well! Do you know if Bruce himself has heard your cover? NEIL: No. I think we’re going to send it to him at some point. CHRIS: I hope he likes it, because I think our version is really very good. We’ve not done it with any sense of irony. CHRIS: It’s a very genuine cover version. NEIL: I think they sound more like Relentless than they are Disco. Let’s take a moment to talk about Relentless, which is your only release that’s no longer available. Any plans to ever re-release it with bonus material? NEIL: Well, there aren’t really any extra tracks to release it with. I agree it’s a shame that it’s not out there. We haven’t [any plans] at the moment, but one day maybe it will [be re-released]. I quite like the fact that you had to buy it at the time. I think there’s something quite exciting about that. I want to thank you for the upbeat Electric closing track “Vocal,” because you gave many fans a scare with both “Legacy” on Yes and “Requiem In Denim And Leopardskin” on Elysium — final songs on each album that possibly hinted at your retirement from pop. CHRIS: That’s very funny, because we have been finishing all of our albums with quite depressing songs recently. It’s quite nice to end on an upbeat note for a change — on a note of optimism. You mentioned “Vocal” was written early on. CHRIS: We started to write that song in Berlin. We thought it was fantastic when we wrote it. We started to record it with Andrew Dawson in Los Angeles, but it wasn’t really coming together right. It didn’t seem to fit the Elysium album. Then we started to work on it again with Stuart. But it didn’t really come together until the day before the album had to be delivered. It was never quite as — we’ve been using this word “banging” all the time, but I can’t think of an alternative word for it — but it’s really pumping, isn’t it, in its present form? It was a bit more laid back in its original state. I mean, this sounds to me like it should be played on the main dance floor in the middle of the night, really. It’s probably the most uplifting, euphoric piece of music we’ve put out in a long time. Your Electric Tour, which seems like quite the energetic spectacle, is underway, and it hits the States in September. What can we expect from it? NEIL: I think you can get quite a strong sense from the video for “Axis,” which is the opening video of the show. And we’ve taken very seriously — with Es Devlin and also the choreographer we’ve worked with, Lynne Page, and our light designer — that the show is called Electric. We wanted to use that word as an inspiration for the way the production feels and looks. The last show, which was very theatrical in a costume-y sense, also had…not a narrative, but a sort of through-line, with the girls with the cubes on their head. There was a relationship between the other two dancers. This one is more impressionistic and electronic. We’ve got lasers for the first time on tour. There’s a lot of backdrop film. There are two dancers who play very specific roles here and there — in that video for “Axis” they are the two people with monster heads. Like the last show, it’s structured in four parts. We went through our back catalog and chose songs that we thought fitted “electric” — songs that we’ve never done before, like “Fugitive,” for instance. It’s a bit darker than the last tour, though it gets very poppy toward the end, of course. And it gets quite euphoric, really. So it goes from electric darkness to euphoria. I’m really looking forward to seeing you do “Fugitive” and “I’m Not Scared” live. Last thing: I’ll land in trouble with my mother if I don’t mention that she just texted and said to tell you hello. She’s been listening to your music since I was a kid. She had no choice in the matter. CHRIS: That’s so nice. Thank you. See you on stage in September.